Camera-trap Ecotourism: the next big thing in conservation? 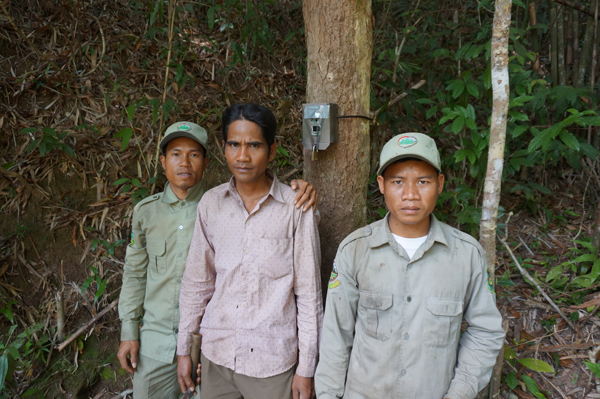 Home » Commentary » Camera-trap Ecotourism: the next big thing in conservation? Ecotourism is a popular growing trend, and this is especially true in tropical countries that have a wealth of biodiversity to offer the interested trekker. Cambodia is no exception. 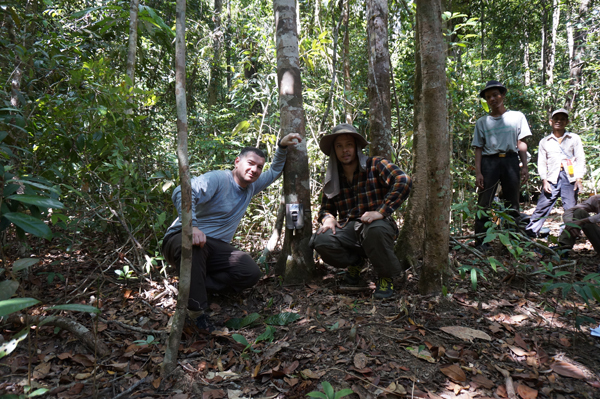 I have been visiting Virachey National Park in northeastern Cambodia for the past five years, but my most recent trip involved a special purpose: setting up 14 motion-triggered camera-traps throughout the park. Without giving away the GPS coordinates, let me say that they are strategically placed in areas where we have a great chance of capturing wildlife images. Sounds like a wonderful plan, right? But there is a problem –how do we check up on the cameras, change memory cards, batteries, clear away foliage that threatens to block the sensors and lenses? Send in the rangers, right? Not so simple. Pre-trek camera and equipment check. Photo by Greg McCann. 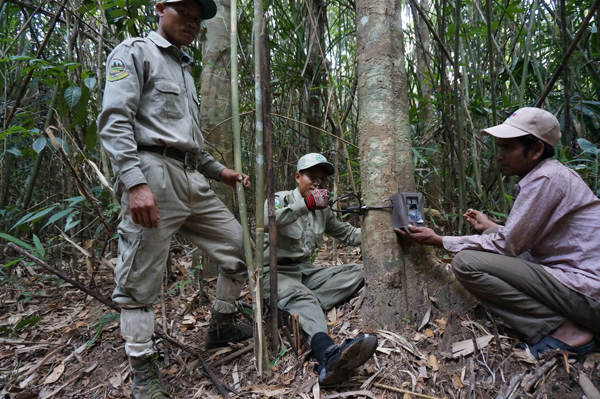 In Cambodia—and in other countries throughout Southeast Asia—national park rangers are in many cases given no budget to go on a multi-day patrol in the forest to fight poachers, let alone to check cameras. These patrols and camera-checks usually have to be paid for by someone else, like a wildlife conservation NGO. Ranger setting up a camera. Photo by Greg McCann. The new NGO that I helped start, Habitat ID, sets up camera-traps in neglected “paper parks” in an attempt to prove—using photographs of wildlife—that these parks deserve being treated like “real” parks that receive adequate protection. However, even NGOs have limited budgets, as we do as a new organization. And so we must find a creative way to have the cameras maintained on a sustainable basis. Our answer: ecotourism. We would like to have ecotourists who trek to Virachey’s beautiful and popular Veal Thom Grasslands essentially pay for the camera-checks. These hearty trekkers (it’s a 6-7 night trek, depending on one’s fitness level and the amount of time they have) would trek to the tourist camp as usual, but with the added bonus of being taken to our camera-trap sites to service the cameras. Not only will these camera-trap ecotourists be able to have a look at what kind of animals are roaming the park when no one is around, but they would also be allowed to download some of the camera-trap photos to keep for themselves and share with friends and family. Best of all, they will know that their participation in this activity furthered the conservation cause in the park, because if it wasn’t for them, those cameras wouldn’t be getting checked for some time. 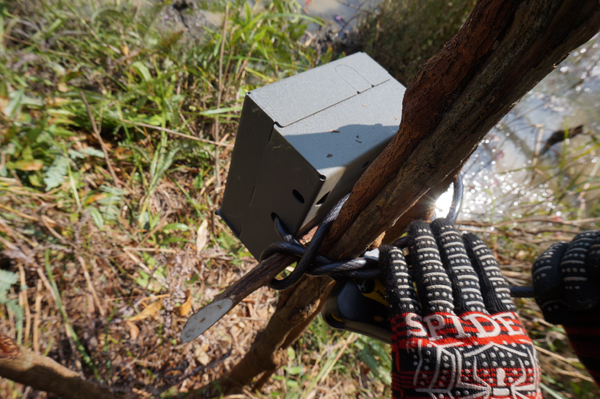 Having serviced camera-traps in Thailand and Cambodia, I can tell you that checking on these devices in the middle of the jungle is thrilling. 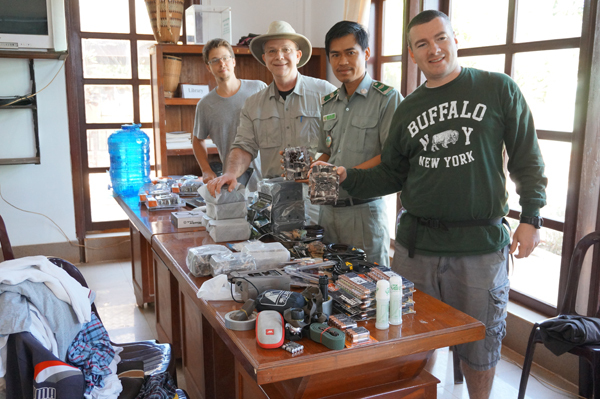 Keys come out, camera comes down, memory card is slipped into a device with a monitor, and everyone—rangers, porters, and NGO workers— huddles around brimming with excitement. Except it’s not a group of school kids crowding around the guy with a new comic book but people who have been to the forest many times yet still feel excited to see what kind of animals are prowling around. 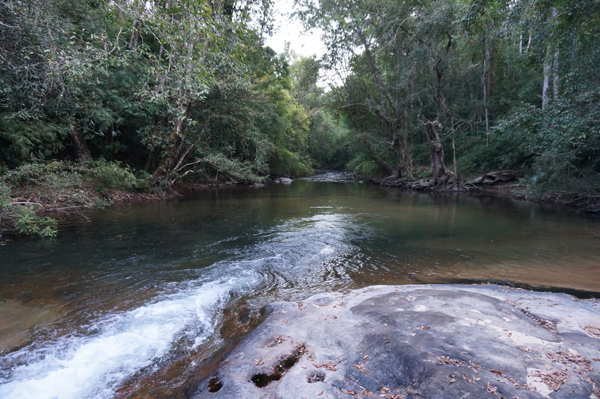 We want ecotourists to experience this feeling, and they can do it in the Veal Thom Grasslands and also at the D’darr Poom Chop waterfall camp in the forests north of the grasslands, a location that offers spectacular swimming and the chance to service yet another camera on the upper Gan Yu River. To my knowledge only three Western people have ever seen this place (D’darr), myself included. Wild pig skull. Photo by Greg McCann. If we obtain photos of tigers or rhinoceros these will be deemed sensitive images and publicity will not be possible. Instead, other NGOs and the Ministry of Environment will be notified. However, we feel that sharing pictures of more common—but equally exciting—animals such as elephants, leopards, clouded leopards, sun bears, and other species is permissible. The fact is that local people know (and have long known) what kind of animals live in the park, approximately where they are, and about how many are still there. 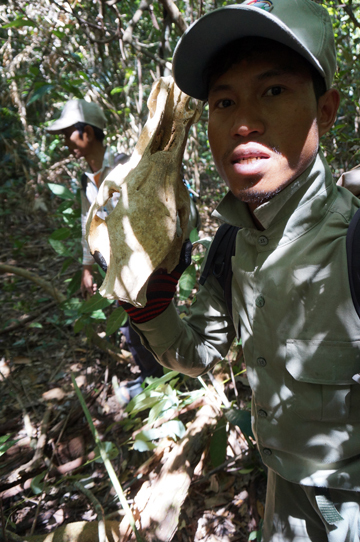 NGOs may like to think that they have insider knowledge with their camera-trap images, but the fact is that local people who are in the forest all year round have an excellent idea of what is still out there in terms of wildlife, and we aren’t really telling them something they don’t already know (as much as we might like to think so). 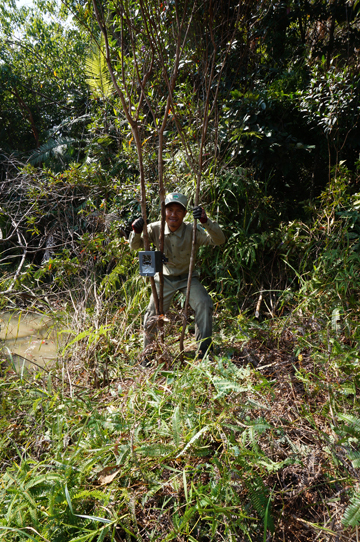 Camera-trap Ecotourism is not something we are trying to patent (indeed, maybe people elsewhere are already doing it). On the contrary, we hope that this can be something that under-funded national parks all around the world can replicate. Creative ways are desperately needed to fund conservation in today’s world, and we hope that ecotourism can be used to pay for various initiatives. 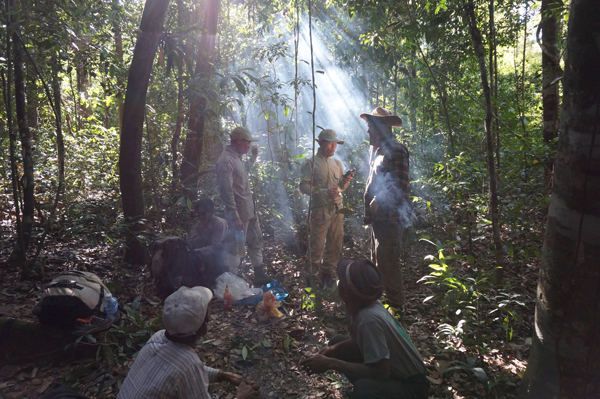 On a final note, not only are the cameras being checked with this ecotourism scheme, but ecotourists are simultaneously paying for rangers to patrol deep into the jungle, which, due to budget constraints, rarely happens. We hope to be reporting back with good news in the future –satisfied ecotourists, serviced cameras, patrolling rangers, and wild animals smiling for the camera. Our cameras are ready and waiting. Photo by Greg McCann. Ecotourists can really contribute to conservation. Photo by Greg McCann. GPS check shows we were just 400 meters from Laos. Photo by Greg McCann. Rangers setting up a camera. Photo by Greg McCann. 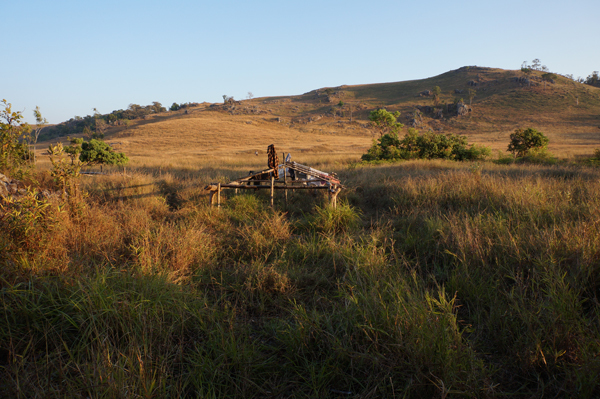 Tourist camp in Veal Thom Grasslands. Photo by Greg McCann. A camera trap. Photo by Greg McCann. 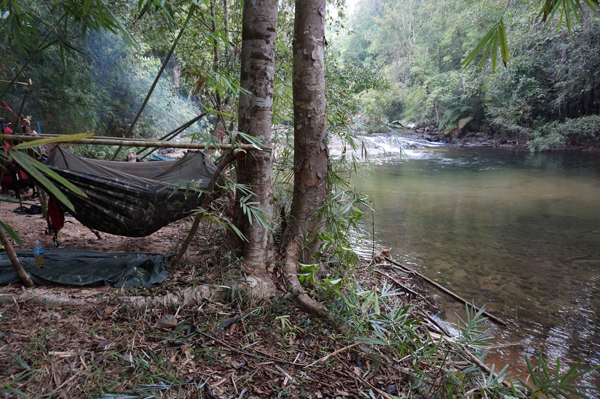 A view of the river at D’darr Poom Chop camp. Photo by Greg McCann. D’darr Poom Chop camp. Photo by Greg McCann. The Mongabay blog is a place for our contributors to share book reviews, photos, and their viewpoints on conservation issues. If you are interested in participating, please contact Brittany.